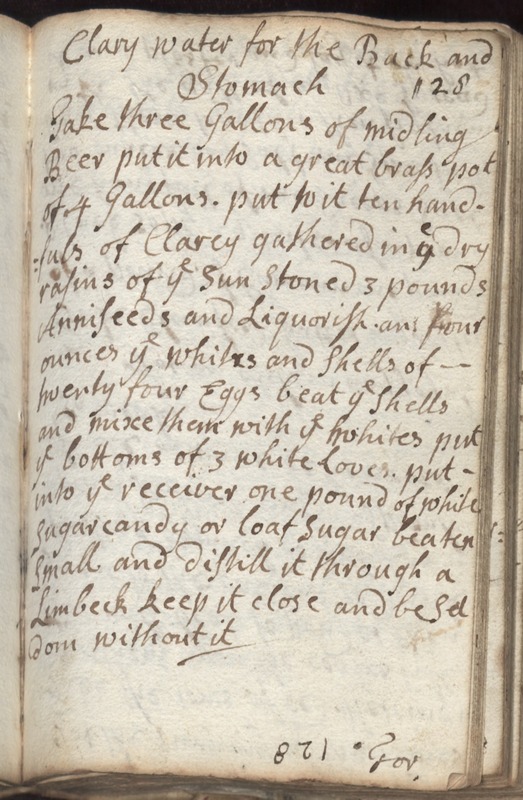 128 Clary water for the back and stomach Take three Gallons of midling beer put it into a great brass pot of 4 gallons. put to it ten handfuls of Clarey gathered in ye dry rasins of ye sun stoned 3 pounds anniseeds and liquorish and four ounced ye whites and shells of twenty four eggs beat ye shells and mixe them with ye whites put ye bottoms of 3 white loves put into ye receiver one pound of white sugar candy or loaf sugar beaten small and [distill?] it through a Limbeck keep it close and be seldom without it.